‘Religious provide an important and prophetic contribution in the Church today. They are working at dangerous frontiers and in difficult situations bringing the Good News and helping people find reconciliation and peace. ', said Fr Sosa. 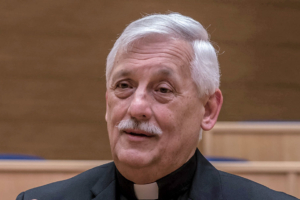 Jesuit Fr General Arturo Sosa has been elected president of the Union of Superiors General (USG). The USG has existed since 1955. It brings together General Superiors of the male religious orders and congregations. Fr Sosa was invited during the meeting to share his analysis and reflections coming out of the Synod on Youth in October. He spoke in particular about the issue of migration, which he described as a ‘global, massive and complex phenomenon’, which particularly affects young people. ‘Hundreds of millions of human beings are on the road in a globalising world. The majority of them are forced to do so by the absence of dignified living conditions in their places of origin, either by structural injustice or by the violence it generates’, he said. ‘The number of displaced human persons and refugees is growing throughout the world. The waves of human beings who embark on the adventure of seeking other horizons are also increasing. The vast majority are young people. Fr Sosa also spoke about the need to fully incorporate young people and women into the pastoral direction of the Church. ‘There is no doubt of the secondary role they play, at the moment, in the structure of pastoral responsibility for the community’, he said. Greater recognition of young people and women requires a ‘complex rather than a simplistic understanding of historical and social processes’, he said. Following his election as USG president, Fr Sosa committed the organisation to ongoing collaboration with its sister organisation, the UISG, which represents the female General Superiors.